VeryDOC Bitmap to Vector Converter uses advanced algorithms to calculate the paths of raster patterns and convert raster patterns to vector ones.It is a key component for many professional,commercial,industrial and scientific activity. 1.Support Microsoft Windows 2000 and later systems of both 32 and 64-bit. 2.Set printing options. It supports to set the width, height, paper size, resolution and page margin of a converted vector image. 3.Rotate images. It offers an option to rotate the page of a converted vector image. 4.Set line color and fill color. 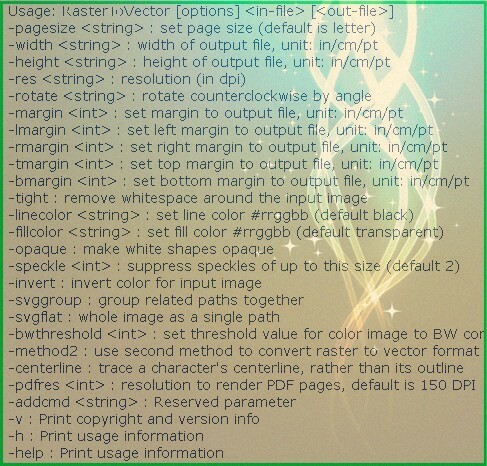 It can set the line color and fill color of a converted vector image. 5.Suppress speckle.It can suppress speckles of the source raster image in the converted vector image. 6.Inverse color. It can inverse the color of the source image in conversion from raster to vector. 7.It can be called in a batch process script. Furthermore, it offers a developer license that permits you to use it in your commercial application distribution package. A VIP Task Management Solution - Task management together with project management and time management, help us achieve the goals we set. We believe that task management is even more powerful because task is a fundamental unit of anything we do. Household Accounting for Excel Pro - All your household accounts at a glance. Household book to the administration of income and expenses. Vehicle Fleet Manager - Designed to service large fleets, small fleets, and everything in between, our fleet management solution will track vehicle and driver statistics, maintenance records, fuel stats, and more. ChequePrinting.Net Software - ChequePrinting.Net is a enterprise cheque printing software that provides a multi-user environment to print and manage your cheques. ChequePrinting.Net provides a complete cheque printing which can print all the cheque elements. TinyBooks Pro - TinyBooks Pro is a simple, non-bloated, single-entry bookkeeping and accounting system for the Macintosh. TinyBooks Pro is designed for Sole Proprietors, home and other small businesses, and family finances. Easy Time Control Free - Free Edition is the ideal choice for small to medium sized organizations and individuals looking for an affordable time and attendance solution. Our Free Edition offers an ideal time management solution that is both powerful and easy-to-use. AllMyNotes Organizer Portable - The most advanced utility to keep all your data password-protected on USB stick, worry free. Simply the best in the class - it provides info password-protection, spreadsheets, reminders, and just looks like magic. Try it out! BarCodeWiz Code 128 Barcode Fonts - Print Code 128 barcodes from any program supporting TrueType fonts. Create Code 128 barcodes in Microsoft Office using BarCodeWiz Toolbar with a click of a button. BarCodeWiz Interleaved 2of5 Barcode Font - Print Interleaved 2 of 5 barcodes from any program supporting TrueType fonts. Create Interleaved 2 of 5 barcodes in Microsoft Office using BarCodeWiz Toolbar with a click of a button.